I thought I knew Canadian history. The stories of the National Dream and the Medicine Line may have been dull compared to the myths of the American "wild" west but they spoke of a nation founded on compromise and good governance. 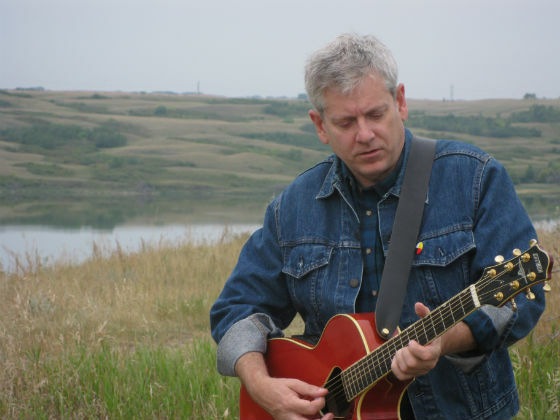 However, as I stood with guitar in hand on the grasslands of the Qu'Appelle Valley I saw my country in a way I had never imagined. Not so long ago on these picturesque fields, Aboriginal children were suffering death rates that were higher than in any western nation until the dark days of the Warsaw Ghetto. And the response from the government of the day to this tragedy was anything but fair. I came to the Qu'Appelle Valley for the filming of the video "Four Horses." It is a musical video project intended to shed light on this dark history. The project was inspired by James Daschuk's harrowing new book Clearing the Plains: Disease, Politics of Starvation and the Loss of Aboriginal Life. Daschuk's work is grounded in years of academic research but his analysis of how John A. MacDonald used starvation as a deliberate policy to break the Tribes of the west is stirring discussion across the country. Writing the song "Four Horses" was my way of being part of the discussion. The metaphoric horses of the Apocalypse -- disease, war, famine and death -- touched a chord with Daschuk and publisher University of Regina Press. We began collaborating on the video to reintroduce this history to a new generation. This is the story of those four horses. As the children coughed blood in the autumn rain. And fenced the land for the CP rail. Daschuk takes us back to the brutal winter of 1878 when Ottawa began receiving reports of the starving Cree, Assiniboine, Okanese and Blackfoot begging for food and dying in front of government forts. The collapse of the buffalo economy was a catastrophe that had been expected for some time. In fact, when Treaty 6 was signed two years earlier, the government made guarantees of food and medicine to help transition the people if hunger hit the plains. But as the winter wore on, MacDonald reneged on the Treaty commitments. In a notorious House of Commons debate, he bragged that the government would withhold food "until the Indians were on the verge of starvation, to reduce the expense." Hunger became a convenient tool for forcing the First Nation people onto marginal reserve lands to secure the development of both the CPR and immigrant farm settlement. So they hung the braves at Fort Battleford. The loss of the buffalo reduced the Plains tribes to destitution. When the starving Cree and Blackfoot went to Fort Battleford to seek food from the Indian Agent the government responded with soldiers, cannons and gatling guns. The Cree had not come to fight. They wanted food for their families. However, when the troopers attempted to move against the hungry people they found themselves overexposed and facing a defeat that would have been larger than the Little Big Horn. Any American can tell you the story of Crazy Horse and Sitting Bull but how many Canadians know the story of the great leader Poundmaker? He ordered the Braves to allow the soldiers to go leave unharmed in order to prevent bloodshed. In response, the federal government "hunted to death" the Cree and Assiniboine braves. A number were publicly executed at Fort Battleford in the largest mass hanging in Canadian history. MacDonald forced the famine-struck families to witness the hanging in order to "convince the Red Man that the White Man rules." The third horse danced for the Great White Chief. Hunger's a lesson that's so easy to teach. But to kill a people you need a bureaucrat man. One of the most disturbing aspects of Clearing the Plains is how the famine became an institutionalized tool used by Indian Affairs used to further degrade the people forced onto reserves. Officials who tried to improve conditions were often fired or overlooked for advancement. For example, the government removed Dr. John Haggerty who is credited with stopping a smallpox epidemic. The government saw his efforts as a waste of money. Instead, the government promoted venal Indian Agents who used the withholding of food and forced sexual favours to lord over destitute communities. Thus was born the bureaucratization of misery that became the hallmark of Indian Affairs throughout much of the 20th century. The pale horse waits at the mission school. Progress they say can be so cruel. As the people find their voice again. The Pale horse is the symbol of death. And nowhere did death take a bigger toll than among the children forced into mission schools where the tuberculosis rates were appalling. But the Four Horses also teaches us something else -- the extraordinary resilience and determination of First Nation people. Despite a century of substandard education, health care and housing, they have not been eradicated or assimilated. In fact, they are now reclaiming their rightful place in Canada.